Participated and presented a paper for discussion on ‘The Ecology of Mother Sita’ at the International Conference on ‘Rediscovering Mother Sita and Her Relevance Today’ organized by the Global Peace Initiative of Women, in Partnership with Jnana-Pravaha, held from March 7 to 9, 2019, in Varanasi. Delivered a lecture on 'Spirituality of Creation in Hinduism' at the Inter-Asian Conference on the Spirituality and Theology of Creation, held from 19 to 21 February 2019, organized by Dharmaram Vidya Kshetram, Bangalore. Presented a paper on “Saving the Environment in the Light of Ancient Indian Thought” at the seminar on ‘Vasudhaiva Kutumbakam’ organized by Vivekananda International Foundation (VIF), New Delhi, on January 16, 2019. Participated and delivered a talk on the ‘Ecological Traditions of India’ at a Panel Discussion on ‘Marine Revival: Myth or Reality’ organized by MOP Vaishnav College for Women, Nungambakkam, Chennai, on January 5, 2019. Delivered Valedictory Address at the Seminar on 'Kala-Samprekshana'- "The Art of Seeing Art" organized by Kalakshetra Foundation, Chennai, on December 25, 2018. Chief Guest at the EXNORA Swachh Awards presentation ceremony organized by EXNORA International on December 21, 2018, at Dr. Ambedkar Auditorium, ICF, Chennai 600 038. Inaugurated the demonstration and exhibition of the unique Korean technique of flower art ‘Ggotggozi’ organized by Inko Centre, Chennai, on November 23, 2018. Chief Guest at the inauguration of the 3-day event on “Healthy Body, Healthy Mind: Celebrating 102 Years of Men-Tsee-Khang’s Public Health Services” held on October 30, 2018 in Chennai. Panel Member on Balancing Human-Animal Interests: Situating Animal Rights in the Indian Political, Religious and Cultural Context at the India for Animals (IFA) Conference organized by FIAPO held from October 26 to 28, 2018, in Hyderabad. Delivered the Valedictory Address at the 25th Silver Jubilee Conference of Tamil Nadu History Congress organized by Department of Indian History, University of Madras, on October 7, 2018, in Chennai. Guest of Honour at the National Seminar on ‘Rethinking the History of Princely States with Special Reference to Cochin and Travancore’ organized by Indian Council of Historical Research, Southern Regional Centre, Bengaluru, on October 5, 2018. Inaugurated the activities of the History Association (2018-2019) of Department of History, Madras Christian College, Chennai, on September 10, 2018. Dr. Nanditha Krishna was in conversation with Mr. S. Vijay Kumar on his book ‘The Idol Thief’ organized by Juggernaut Books and The C.P. Ramaswami Aiyar Foundation held on August 31, 2018, in Chennai. Guest of Honour at the inauguration of the Art and Craft exhibition on ‘A Walk Through Heritage – My Town My Pride’ in connection with the Silver Jubilee celebration of The Akshaya Vidya Trust, Vedavalli Vidyalaya, Ranipet, held on August 19, 2018, at C.P. Art Centre, Chennai. Participated and delivered a lecture on 'The Making of Ganesha' at the Gaj Mahotsav held in New Delhi organized by Wildlife Trust of India on August 14, 2018. Dr. Nanditha Krishna inaugurated a music workshop for school and college students on August 4, 2018, at 8.30 a.m. organized by The Music Academy & The Music Forum, Chennai. Dr. Nanditha Krishna delivered a lecture on “The Journey: The Story of Women Writers in Indian History, Religion and Literature” at the Dehradun Community Literature Festival 2018 held on April 20, 2018, organized by World Integrity Centre (WIC), Dehradun. Dr. Nanditha Krishna was in conversation with Mr. Abhijay Negi on “A Living Past: History and Environment” at the Dehradun Community Literature Festival 2018 held on April 20, 2018, organized by World Integrity Centre (WIC), Dehradun. Dr. Nanditha Krishna delivered a lecture on ‘Assault on the Environment’ at the National Conference on ‘Indian History – Emerging Perspectives’ organized by Indian Council of Historical Research, New Delhi, from March 5 to 7, 2018. Delivered a lecture on ‘Women Role Models – For Changing Value Systems’ at the Women’s Conference on ‘Women in an Era of Globalization – Identity, Freedom and Survival’ organized by Bharatheeya Vichara Kendram, Trivandrum, on October 22, 2017. Dr. Nanditha Krishna was in conversation with Mr. Jairam Ramesh on his book ‘Indira Gandhi: A Life in Nature’, about the ‘Green Policies and the Legacy of Indira Gandhi’ organized by The Hindu Centre, Chennai, at Kasturi Srinivasan Hall, The Music Academy, on July 6, 2017. At the Interfaith Rainforest Initiative Launch and Roundtable held from June 19 to 21, 2017, at Oslo, Norway, organized by UNDP and Royal Norwegian Ministry of Climate and Environment, Norway, in the presence of His Majesty King Harald V of Norway, Dr. Nanditha Krishna delivered a talk on the ethical and spiritual basis in Hinduism for protecting Rainforests and the importance of an interfaith action agenda to end deforestation. Delivered Opening Remarks at the National Seminar on ‘A Hundred Years of ‘Nritya Bharateeyam’ organized by Indian Council of Historical Research (ICHR), Southern Regional Centre, Bengaluru, in collaboration with Bharata-Ilango Foundation for Asian Culture (BIFAC) and C.P. Ramaswami Aiyar Institute of Indological Research (CPRIIR), Chennai, on June 1, 2017. Delivered the Special Lecture on 'Groves and Gods of Tamilnadu' in connection with the Indian Council of Historical Research's (ICHR) 45th Foundation Day at ICHR Southern Regional Centre, Bengaluru, on April 24, 2017. Delivered the Keynote Address at the two-day National Seminar on “Depiction of Epic Stories in South Indian Art” organized by Indian Council of Historical Research (ICHR), Southern Regional Centre, Bengaluru, on March 8 and 9, 2017, at Sri Venkateswara University, Tirupati. Delivered a lecture on “Cambodian Representations of Hindu Concepts” at the International Seminar on 'Indian Sculptural Art: Intra/Inter Asian Linkages' organized by the Department of Ancient History and Culture, University of Calcutta, on February 11, 2017. Delivered Presidential Address at the National Conference on the “Bhagavata Purana: History, Philosophy and Culture” organized by Department of Philosophy, University of Madras, and CPR Institute of Indological Research held at the University Centenary Building on January 6, 2017. Chaired the Session on ‘Rāmānuja and other Schools of Indian Philosophy’ at the International Conference on “The World of Rāmānuja: Tradition and Thought in History and Today” organized by Department of Philosophy, University of Madras, Chennai, on January 3, 2017. Participated and presented an introductory note on 'Hinduism and the Environment' at the workshop on 'Religion and Climate Change in Cross-Regional Perspectives' organized by American University's Center for Latin American and Latino Studies, co-sponsored and hosted by the Observer Research Foundation, in New Delhi, on December 8 & 9, 2016. Delivered Welcome Address at the 50 Golden Years of The C.P. Ramaswami Aiyar Foundation on October 15, 2016. Hon'ble Chief Justice, Shri. T.S. Thakur, was the Chief Guest; Dr. Gopalkrishna Gandhi presided over the function; Justice Smt. 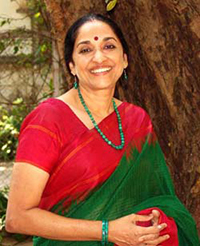 Prabha Sridevan participated. Delivered a lecture on "Paradise Lost!? Changing Water Cultures in Chennai and Tamil Nadu" at Chennai Water Forum, organized by Goethe Institut, Max Mueller Bhavan, at Rukmini Arangam, Kalakshetra Foundation, Chennai, on October 6, 2016. Released ‘A Short Biography of Sir C.P. Ramaswami Aiyar’ written by Sri. G. Shanmuganathan on September 10, 2016, organised by Wesley Higher Secondary School, Royapettah, Chennai. Dr. Nanditha Krishna was in conversation with the author Dr. C.K. Gariyali, I.A.S., (retd.) of the book ‘My Beautiful Journey – From Kashmir to Kanyakumari’ on September 1, 2016, at 6.30 p.m. organized by Madras Book Club and Amethyst. Delivered Valedictory Address at the National Seminar on ‘Environmental and Ecological Awareness in Ancient India’ organized by The Kuppuswami Sastri Research Institute, Chennai, on July 9, 2016. Participated and delivered a talk on ‘Cultural and Ethical Values in Hindu Traditions’ at the International seminar on Science and Religion Cooperation for Environmental Care (ISREC): Rethinking "Laudato si", held in the Shrine of Torreciudad, Spain, on June 20 and 21, 2016. Presided over the function ‘Mathru Devo Bhava’, an evening that celebrates revered mothers, organized by Lalitha Arts and Music Promotion Social Trust (LAMPS), Madurai, on April 16, 2016. Delivered the Valedictory Address at the National Conference on ‘Socio-Cultural Transformation in 20th Century South India’ organized by Department of Indian History, University of Madras, on March 24, 2016. Delivered the Convocation Address at the 7th Annual Convocation Ceremony of the Karnataka State Women’s University, Vijayapura, on March 4, 2016. Launched the first issue of the magazine “REFLECTIONS” published by SSKV College of Arts and Science for Women, Kanchipuram, on February 29, 2016. Participated in the National Level Panel Discussion on “Green environment and Development: Is it an Intractable Conflict?” organized by CEMO (Centre for Ecological Movement), Kolkata, on January 30, 2016, held at Calcutta Club, Kolkata. Delivered Welcome and Keynote Address at the National Conference on the ‘Iconography of the Hindus, Buddhists and Jains’ organized by C.P.R. Institute of Indological Research, Chennai, on January 8, 2016. Attended the UN Bristol Meeting on ‘Faiths and the Sustainable Development Goals (SDGs)’ held in Bristol, UK, from September 7 to 10, 2015, organized by United Nations Development Programme (UNDP) and the Alliance of Religions and Conservation (ARC). Delivered Keynote Address on ‘Environmental Education as a Craft of Teaching, Learning and Research’ at the workshop on Re-envisioning Environmental Education and the Craft of Teaching, Learning and Research organized by Centre for Environmental Studies, Lady Doak College, Madurai, on August 19, 2015, followed by a powerpoint presentation on ‘Sacred Plants and India’. Chief Guest at the Professor M.S. Swaminathan Award for Environmental Protection on 6th August 2015 at 6.30 p.m. at the Crown Plaza Hotel, Chennai, organized by Rotary Club of Madras East. 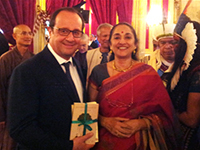 Dr. Nanditha Krishna was invited to participate in the Sommet des Consciences pour le Climat (Summit of Conscience for the Climate) organised by M. Francois Hollande, President of the French Republic, in Paris on July 21, 2015, where leaders of several world religions, environmentalists and world leaders were present. Delivered a lecture on ‘Cheriyal Paintings’ organized by the C.P. Ramaswami Aiyar Foundation on July 11, 2015. Delivered a lecture on ‘Madras – Chennai’ for students of Edinburgh University, UK, on June 26, 2015, organized by the British Council, Chennai. Delivered the Welcome Address at the ICHR sponsored two-day National Seminar on 'Popular Uprisings in India with Special Reference to Tamilnadu - 1750-1857 CE' on Friday, January 9, 2015, organized by C.P.R. Institute of Indological Research, Chennai. Delivered the Presidential Address at the 3rd Indian Biodiversity Congress (IBC) held from December 18 to 20, 2014, at SRM University, Kaattankulathur, organized by Centre for Innovation in Science and Social Action (CISSA), Thiruvananthapuram; C.P.R. Environmental Education Centre (CPREEC), Chennai; School of Public Health, SRM University, Kaattankulathur; and Navdanya, New Delhi. Chief Guest at the Silver Jubilee Celebrations of MOOWES (The Marketing Organization of Women Entrepreneurs) on Thursday, October 9, 2014, at Chennai. Delivered a talk on 'Captive Elephants' at a Panel Discussion on 'Climate Change and Human-Wildlife Interaction' organized by Centre for Media Studies (CMS), in association with Pondicherry University, between 3.00 and 5.00 p.m. on October 9, 2014. Chief Guest and addressed the gathering at the Founder’s Day and Annual Day of The Hindu Senior Secondary School, Indira Nagar, Chennai, on Saturday, September 6, 2014, at 5.00 p.m. Delivered the welcome address at the "Capacity Building Workshop on Cites Appendix Ii Listings of Sharks and Manta Ray Species" held from August 26 to 28, 2014, at Deccan Plaza Hotels, Chennai. Delivered the Keynote Address at the "High Level Consultation on Capacity Building Workshop on Integrating Climate Change Concerns in Development Planning" on August 19, 2014, organized by Department of Environment and Forests, Government of Tamilnadu. Delivered a talk about goodness at the 'Goodness Festival' organized by Brahma Kumaris on Friday, June 27, 2014, at 9.00 a.m. Delivered a lecture on "Balancing Environment & Economic Development" at the workshop on Balancing Environment and Economic Development held at Hotel My Fortune, Cathedral Road, Chennai, organized by Madras Chamber of Commerce & Industry (MCCI) on Wednesday, June 25, 2014. Attended the inaugural function of the Centenary Year Celebration of the Department of Indian History, University of Madras, and felicitated the Centenary Year Celebration of the University of Madras, on Monday, June 23, 2014. Chief Guest at the Silver Jubilee Celebrations of Sir Sivaswami Kalalaya Senior Secondary School, held at 9.30 a.m. at the Bharatiya Vidya Bhavan’s Dr. Preetha Reddy Auditorium, Mylapore, Chennai, on Saturday, June 21, 2014. Jinja Hocho, the Association of Shinto Shrines in Japan, and ARC (Alliance for Religions and Conservation), headquartered in London, invited me to attend “Traditions for the Future: Culture, Faith and Values for a Sustainable Planet” from 31 May to 5 June 2014, at Ise, Japan. Chief Guest at the Silver Jubilee Celebrations of EXNORA, Chennai, at 6.00 p.m. on April 27, 2014, at Vani Mahal, Chennai. Chief Guest at the release of the book titled “Ecoambiquity, Community, and Development: Toward a Politicized Ecocriticism” edited by Scott Slovic, Swarnalatha Rangarajan and Vidya Sarveswaran and delivered a lecture on “The Ecological Traditions of India” organized by The Department of Humanities and Social Sciences, IIT Madras, at 4.00 p.m. on Friday, April 25, 2014. Chief Guest at the graduation ceremony of the 25th batch of students of the Primary Montessori Training Programme organized Centre for Montessori Training-Chennai (CMT-C) at 4.00 p.m. on April 11, 2014. Guest of Honour and delivered a lecture on “Inspiring Change” at the celebrations of International Women’s Day organized by Women’s Grievances Retrieval Committee, SRM University, on March 7, 2014. Delivered the 2nd Prof. E.K. Janakiammal Memorial Lecture on "Sacred Plants of India" at the 26th Kerala Science Congress, organized by the Kerala State Council for Science, Technology and Environment (KSCSTE), at Kalpeta, Kerala, on January 28, 2014. Delivered a lecture on "Humane Education" at the Seminar on Animal Welfare on January 24, 2014 held at Trivandrum, organized by C.P.R. Environmental Education Centre, Chennai. Chief Guest at the Fifty-First Anniversary of Vellayan Chettiar Higher Secondary School, Thiruvotriyur, on Wednesday, January 22, 2014. Chief Guest at the Graduation Day for the students of BFA & MFA Bharatanatyam (Distance Mode) and delivered the address on "Bharata Natyam" organized by Sastra University, Thanjavur, and Nrithyodaya, Chennai, on Sunday, October 27, 2013, at 10.00 a.m. Delivered Keynote Address on "Education for a better Future - Education for Sustainable Development (ESD)" at the workshop on Education for a Better Future held at Trivandrum organized by WWF-India, Kerala State Office, on October 10, 2013. Delivered Keynote Address on "Culture, Heritage and the Environment" at the 9th Kerala Environment Congress (KEC-2013) held at Trivandrum, Kerala, organized by Centre for Environment Development, Trivandrum, on October 9, 2013. Resource Person for a thematic Dance Festival of Natyarangam's “Bhoopaala Bharatham” (Kings as Protectors of the land and people) on “Marthanda Varma & Swathi Thirunal” choreographed and performed by Parvathy & Shijith Nambiar on August 31, 2013, at 6.30 p.m., organized by Narada Gana Sabha, Chennai. Participated as a Panel Member and presented a paper on “Green Pilgrimage – Hinduism and the Environment” at the Green Pilgrimage Network Meeting held from July 25 to 29, 2013 in Trondheim, Norway, organized by the Municipality of Trondheim, Nidaros diocese, Alliance of Religions and Conservation (ARC) and the National Pilgrim Centre (organised under the Directorate for Cultural Heritage). Lecture Tour on 'Animals in Hindu Dharma' organized by The Bali Animal Welfare Association (BAWA), Bali, Indonesia, from April 18 to 27, 2013. Delivered Prof. Hiralal Gupta Endowment Lecture at the Annual Congress of Loyola Forum for Historical Research, Loyola College, Chennai, on February 28, 2013. Addressed the gathering on “ANIMAL WELFARE FROM A HINDU DHARMA PERSPECTIVE” organized by The Bali Animal Welfare Association (BAWA), Bali, Indonesia, on November 7, 2012 at the Institute of Hindu Dharma, Bali, Indonesia. Addressed the session on “Credibility of our News Media: Is Journalism at Stake?” at the annual Media & Entertainment Business Conclave (MEBC-South) organized by Federation of Indian Chambers of Commerce and Industry (FICCI) held in Chennai on October 17, 2012. “Global Environmental Changes – Challenges and Innovations”, Valedictory Address at the International Open Science Conference on “Global Environmental Changes – Challenges and Innovations”, Department of Applied Geology, University of Madras, Chennai, February 2012. Dr. C. Minakshi Memorial Lecture, Women’s Christian College, Chennai, October 2011. “Cultural Links of Biodiversity”, First Indian Biodiversity Congress, Thiruvanandapuram, 2010. “The History of Trees in Early Indian Culture and Art”, Prof. R. Sathianathaier Endowment Lecture – 2009-2010, University of Madras, Chennai, March, 2010. “South Indian Jewellery”, presented at the Seventh International Conference on the Beginnings of the Use of Metals and Alloys (BUMA), organized by School of Humanities, National Institute of Advanced Studies, Bangalore, September, 2009. “The Impact of the Environmental Change on Indigenous People in the Nilgiris”, presented at the First World Congress of Environmental History, 2009, Conference on Local Livelihoods and Global Challenges: Understanding Human Interaction with the Environment, Copenhagen, Denmark, August, 2009. “Artificial Irrigation Systems in Tamil Nadu and Cambodia”, International Conference on Religion and Culture in Bali, Indonesia, June, 2009. “Murals of the Varadaraja Perumal Temple, Kanchipuram”, presented at the Conference on Indian Painting: The Lesser Known Traditions, March 8-9, 2008, Museum of Fine Arts, Houston, U. S. A. “A People's History of India”, Presidential Address at the 38th Annual Conference of the Institute of Historical Studies, Calcutta, held at Mother Teresa Women's University, Kodaikanal, November 8, 2001. “Ethno-archaeology and Indian Art”, The Sankara Parvathy Endowment Seminar, Department of Ancient History and Archaeology, University of Madras, March 27, 2001. “Women in Politics”, Centre for Contemporary Studies, Chennai, November 13, 1999. “Environment and History”, Indira Gandhi Endowment Lecture, Stella Maris College, Chennai, September 9, 1999. “Environment and Culture”, Keynote address at the Conference on Cultural Adaptation: the Relationship between Man and Environment, Centre for Social Development and Management Research, Chennai, August 27, 1999. “Conserving our Natural Resources”, Keynote address at the Conference on Land Use, Ecology and Resources, Association of Geography Teachers, July 13, 1999. “Iconography and Socio-Cultural Development”, Keynote address at the Seminar on Iconography and Socio-Cultural Development, C.P. Ramaswami Aiyar Institute of Indological Research, 1998. “Art and Cultural History”, Presidential Address at the Art and Culture Section, Tamilnadu History Congress, Annamalai University, Chidambaram, 1995. Chaired the session on “Malnutrition and Healthcare” in connection with a workshop on “Defining the Role of Women Scientists and Teachers in Promotion and Application of Science and Technology” organized by the M. S. Swaminathan Research Foundation, Chennai, on Saturday, March 23, 2013. Received the audio CD at the inauguration of Poetry with Prakriti with a Music Performance and Book and CD Launch of Pallaki Seva Prabhandhamu, A Telugu Musical Opera Authored by Sahaji Maharaja of Thanjavur (r.1684-1712) by the disciples of Sangita Kalanidhi Smt. R. Vedavalli on December 4, 2012, at 6.30 p.m. organized by Prakriti Foundation, Chennai.